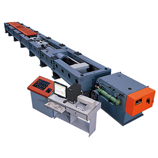 HUALONG Horizontal tensile testing machine is designed specifically for wire, rope, chain, shackle and cable testing, these test frames use a horizontal test opening to accommodate long specimens and high elongation demands. These test frames are powered by hydraulics for high strength testing and can be customized in length to meet a variety of application requirements as well as the grips can be modified to accommodate different shaped specimens and alternate grips can be provided for customers to interchange as and when their test requirements change. PC-based machine control software provided with the machine is upgraded to include data acquisition and data analysis.